Jannotti-Passos, Liana K.; Ruiz, Jeronimo C.; Caldeira, Roberta L.; Murta, Silvane M.F. 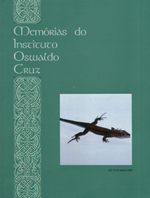 ; Coelho, Paulo Marcos Z. & Carvalho, Omar S.
Mitochondrial DNA of Biomphalaria tenagophila , a mollusc intermediate host of Schistosoma mansoni in Brazil, was sequenced and characterised. The genome size found for B. tenagophila was 13,722 bp and contained 13 messenger RNAs, 22 transfer RNAs (tRNA) and two ribosomal RNAs (rRNA). In addition to sequencing, the mitochondrial DNA (mtDNA) genome organization of B. tenagophila was analysed based on its content and localization of both coding and non-coding regions, regions of gene overlap and tRNA nucleotide sequences. Sequences of protein, rRNA 12S and rRNA 16S nucleotides as well as gene organization were compared between B. tenagophila and Biomphalaria glabrata , as the latter is the most important S. mansoni intermediate host in Brazil. Differences between such species were observed regarding rRNA composition. The complete sequence of the B. tenagophila mitochondrial genome was deposited in GenBank (accession EF433576). Furthermore, phylogenetic relationships were estimated among 28 mollusc species, which had their complete mitochondrial genome deposited in GenBank, using the neighbour-joining method, maximum parsimony and maximum likelihood bootstrap. B. tenagophila was positioned at a branch close to B. glabrata and Pulmonata molluscs, collectively comprising a paraphyletic group, contrary to Opistobranchia, which was positioned at a single branch and constituted a monophyletic group.